Apple je izbacio novu verziju iTunes-a za preuzimanje 10.5.2 koja donosi nekoliko poboljsanja u odnosu na prethodnu verziju. Od novosti tu su poboljsanja za iTunes Match i popravlja problem sa audio distorzijom prilikom pustanja ili ripovanja odredjenih CDova. • iTunes Match. Store your entire music library in iCloud, including music you’ve imported from CDs, and enjoy your collection anywhere, anytime, on your iPhone, iPad, iPod touch, computer, or Apple TV. This software may be used to reproduce materials. It is licensed to you only for reproduction of non-copyrighted materials, materials for which you own the copyright, or materials you are authorized or legally permitted to reproduce. If you are uncertain about your right to copy any material, contact your legal advisor. © 2011 Apple Inc. All rights reserved. Apple, the Apple logo, and iTunes are trademarks of Apple Inc. Other names may be trademarks or registered trademarks of Apple in the U.S. and elsewhere. PowerPC is a trademark of International Business Machines Corporation, used under license therefrom. Intel is a trademark of Intel Corp. in the U.S. and other countries. See www.apple.com/legal/trademark/appletmlist.html for more information. 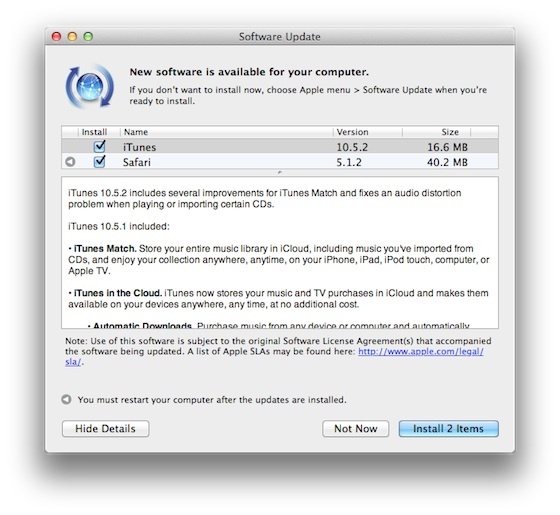 Novi iTunes mozete preuzeti dektno iz instaliranog iTunes-a (Help/ Check for Updates) ili preko Apple download sajta.